This bedroom gets the southern light, so it probably would have been the master bedroom for Colby parents and their babies born in this room. 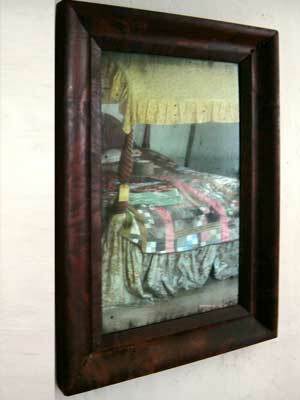 The canopy bed is reflected in the mercury-based mirror that is framed in a faux-wood painted frame. 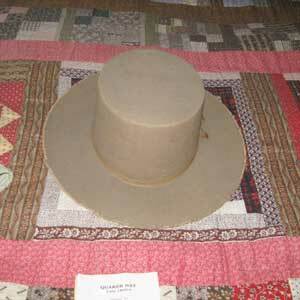 This top hat is made from beaver hide. 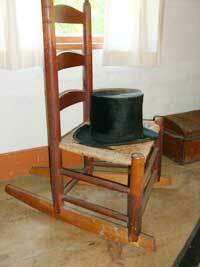 The Quaker hat that belonged to poet John Greenleaf Whittier (1807-1892) sits on the canopy bed at the Macy-Colby House. Whittier was a poet and reformer, who lived on Friends Street in Amesbury. He was a Quaker and a staunch abolitionist. Whittier was a prolific writer who penned the poem entitled, "THE EXILES," about Thomas Macy's kind act of sheltering four outlawed-Quaker strangers during a thunderstorm. Macy's subsequent battle with authorities led to his leaving Amesbury and taking a perilous journey with his family to the island of Nantucket where he found asylum.